There is a new obsession in our house and it’s called Diary of a Wimpy Kid! Wyatt had been hearing about the Diary of a Wimpy Kid series for awhile and was very interested in reading them, but he hadn’t managed to get his hands on a copy because the waiting list at the library was long, long, long. These books are popular — all seven of the books in the series have been #1 best sellers — and word that they’re good seems to have spread through the third graders at my son’s school. When I was offered a copy of the first book for review, I knew I couldn’t say no. Wyatt was extremely excited when our copy arrived. So excited that he ripped the package open, whooped and hollered for a few minutes and then immediately sat down in the rocker in our living room to read it. And I’m not exaggerating when I say that he barely got up again until he finished it! I had to force him to put it down for meals (he tried to bring it to the table) and he was just a smidge annoyed when I made him stop reading to go to bed. He was done with his first read-through before he left for school the next morning and a few days later he picked it back up and read it all over again! Seriously, dude! “OK, Pursie.” Ha ha ha! The book captures exactly how mean kids can be so perfectly. 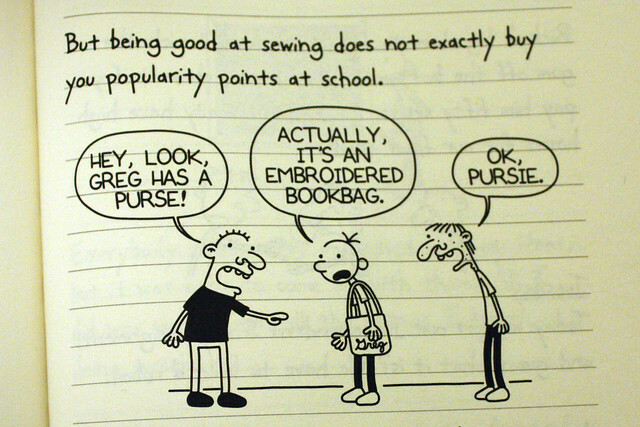 And that brings me to another point: Greg is totally relatable because he’s a fully drawn character. Bad things happen to him, but he also causes problems for other kids. He is oblivious to how mean he is to his best friend, Rowley, a sweet and agreeable boy who lives up the street. Greg is constantly dragging him into his schemes and poor Rowley goes along with them to his own detriment. I found that Greg and Rowley’s relationship was a great jumping off point for a discussion about being a good friend with Wyatt. We talked about how Greg treats Rowley, what finally causes Rowley to snap and how Greg apologizes to his friend without ever actually saying the word “sorry”. I swear to you, this photo is not staged! 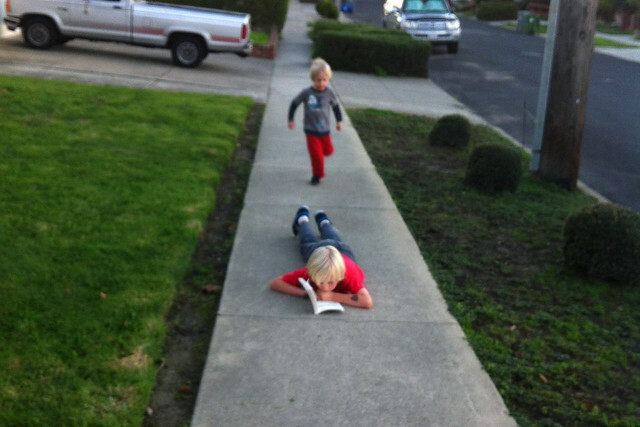 He plopped himself down in the middle of the sidewalk and dug into his book while Augie ran and jumped around him. Want to win your own copy of a Diary of a Wimpy Kid book? I am giving away ONE (1) copy of a Wimpy Kid book of your choice from books one through seven! (Diary of a Wimpy Kid, Rodrick Rules, The Last Straw, Dog Days, The Ugly Truth,Cabin Fever, and The Third Wheel). To enter, leave a comment below sharing a cringe-worthy middle school memory. Comments will be closed Saturday, December 15 at midnight and I’ll choose one random winner shortly thereafter. The winner will have 48 hours after I notify them via email to respond with their mailing address. (Sorry, but this giveaway is open to U.S. addresses only.) If I don’t hear from you an alternate winner will be selected, so be sure to leave your email address and check your email. My little one loves the Wimpy Kid books and hasn’t read the newest one yet. 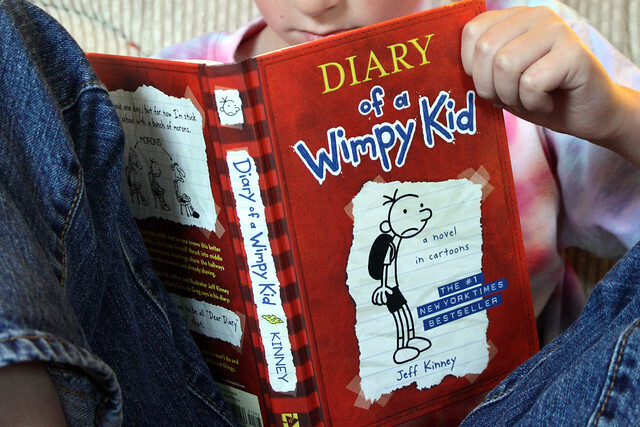 We love the Wimpy Kid books, but have only read the first few. I think I’ve blocked out most of my middle school memories! I do remember making a particularly disastrous cake in Home Ec. Apparently we switched two of the ingredient amounts, and the cake was disgusting. Our group sat down to try the cake (which didn’t look so good, but we thought we’d try it), and were grossed out. John can’t WAIT to be able to read the Wimpy Kid books! I think knowing that he had one here waiting for him would get him to practice his reading even more than he already does 🙂 Middle school was a disaster for the most part for me. One particularly cring-worthy moment, though, was my first school dance at the school I had just transferred into. Being the new kid I was conned into believing that it was semi-formal so I got all dressed up …. and everyone else was there in jeans and tshirts. Yeah, I left about as soon as I arrived. My most cringe worthy memory would be the day my period started. I was too embarrassed to ask for help, and I was just hoping no one would notice, but I soon had a large red stain on my powder blue dress (it was picture day). A sweet teacher finally pulled me aside and sent me to the nurse, who called my mom. But by then, of course, everyone had noticed. When I started middle school my mom bought me the school gym uniform – hideous polyester shorts and shirt. Of course, all of the cool kids were wearing “plastic shorts” and cool logo T-shirts but I had to wear polyester. (anyone else remember plastic shorts, they were the precursor to the Umbro soccer shorts that were popular when I was in High School). My cringe worthy middle school moment was just after I started getting regularly monthly cycles and I didn’t know that people don’t wear white when they have their period. Long story short, I leaked, my entire class laughed, I ran to the bathroom in tears and a friend brought me a new maxi pad. I went to my locker got my coat to wear around my waist and wan to crawl into my shell and hide. Too bad the give-away is only for U.S. addresses.. But understandable. I love seeing pictures of your environment, even the sidewalk is completely different than the ones here in Holland! Ah, cringe-worthy middle school…too many to name, sadly! Probably the best would be my self-haircut. My mom always trimmed our bangs when we were kids and as I often got impatient with waiting for a good time to get my trim. So…I took scissors to bangs myself. In an effort to get them “just right” and “perfectly even” I kept on trimming first the left side, then the right, until they were finally even…and only about one-half inch long! My mother nearly fainted when she saw them but the only answer was to deal with the result and wait for them to grow out. Sadly, school picture day was less than a week away. So not only did I have a horrible-looking bang trim, but it was forever memorialized in the school yearbook. Ugh! I allowed my mom to cut my bangs…the weekend before school pictures! UGH!!! But I still smiled and looked cute in my brown flower jumper!